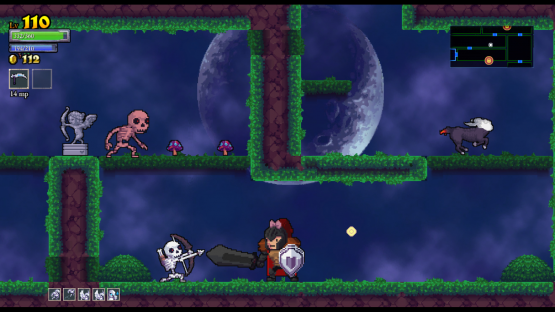 Rogue Legacy has built a large following from seemingly thin air as a smash hit on Steam. The punishing-yet-endearing, platforming, side-scrolling RPG hack-n-slash rouge-like adventure mashup (whew!) is headed to all the current PlayStations (well, not the PSP) this summer. Want to know how it feels on the Vita? Read our E3 preview to find out. For those who may not know, Rogue Legacy is what’s known as a Rouge-“LITE.” What this means is that while you only have one life for each playthough, you do get to keep your stats. The levels of the castle are procedurally generated, ensuring no two games play the same. In honor of the Rouge-like tradition, this game is punishingly, brutally hard. Minor mistakes can and will cost you your life. But get into a nice groove, and the game can certainly stretch for a good while until your inevitable demise. If that point wasn’t hammered enough, Rogue Legacy is hard. Expect to die often, and by embarrassing means. In what I played of the demo, I died by spikes in the floor at least a couple of times because I wasn’t paying attention to slight cues in the floor while my health was low thanks to enemies I had encountered earlier. Speaking of enemies, expect to encounter the gamut of foes you’d expect from traditional RPGs, such as skeletons, phantom wizards, and other ugly things, as well as obscure enemies such as gigantic eyes. Rogue Legacy‘s claim to fame is its random character generation and genealogical “story.” After you die (and remember, you will die, a lot), your character leaves you with some parting advice. You can then play the game again, in a newly-generated castle, and as the previous character’s heir. You maintain all the gold you picked up in the previous run through, but you must spend as much of it as you can on permanent upgrades, since the toll keeper known as Charon will take all of your remaining gold each time you wish to re-enter the castle. Gamers looking for a solid challenge should definitely check out Rogue Legacy when it drops this summer. This is nearly Ghosts ‘n Goblins-level of hard, but rewards you for each quest you partake in. Leveling up and bringing home some gold is rewarding, and the game’s humor helps to set the tone and will hopefully serve to alleviate any controller/console-throwing rage that some gamers may feel when they die over, and over, and over, and OVER again. One of Rogue Legacy‘s unique features is the randomly-generated traits of each character that you play as. Whether your character suffers from gigantism or color-blindness, expect gameplay to reflect your character’s particular unique trait. Sure, there is seemingly always a “normal” character to choose from, but who wants to play as someone with nothing remarkable about them? This one small twist infinitely adds to the game’s replayability, because there is likely some combination of traits that you have yet to experience the game with, no matter how many runs you have had. If you’re a fan of the series already, and have a Vita, there is no doubt that you should pick up Rogue Legacy when it releases later this year. If you’re a fan of Rougelikes, this is going to be another easy buy for you. If you’re a fan of challenging RPGs, again, this is the game for you! From what I played at E3, the game is almost ready to go.